Real Madrid is trying hard to get Robert Lewandoski replace Karim Benzema at Real Madrid next season. The white club has been in constant contact with the player and his agent, Pini Zahavi, but the negotiations have been broken after the reluctance of Bayern and the price they ask for the German striker, according to Sky Sport. Real Madrid has decided to leave negotiations with Lewandoswi and his agent in neutral for the price that Bayern Munich has asked for the player. The Bavarian club is not willing to lose its reference in attack for less than 100 million euros, a figure that the white club considers exorbitant. In fact, Bayern general director, Karl-Heinz Rummenigge, closed on Wednesday any door to an exit of Lewandowski: "We are very fortunate to have Lewandowski and even more so that he has signed a long contract with us. There is nothing to worry about. He will also play at Bayern Munich next season." Bayern have always had a strong stance regarding the departure of their players. "No one can sign a Bayern player against the will of Bayern," warned Rummenigge. A similar situation occurred when Real Madrid tried to sign Ribéry in 2009 before a sharp and threatening refusal: "We will denounce Madrid to FIFA if it insists because he has a contract". 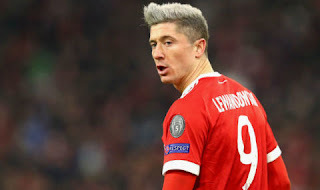 However, Lewandowski already made clear to his teammates that he wanted to leave Bayern at the end of the season and even changed agents (Pini Zahavi, the same who is negotiating the signing of Neymar) with the aim of softening the German club and making his exit as easy as possible. In addition, Zidane also would have given the green light to his signing, but the demands of Bayern have forced Real Madrid to cool the negotiations and wait for Lewandowski to force his departure. More than a clash between clubs, there seems to be internal conflict in Munich. What everyone seems to agree with is that Real Madrid and Florentino Perez are ready to bid to form the most dangerous attack of all football clubs. According to international media, Madrid wants Neymar and Salah. Therefore, if you add these names to Lewandoswi and Cristiano Ronaldo, the rest of the teams will suffer undoubtedly.